Absolutely bombproof family camping tent. I have been using this tent every year for myself, wife, and two kids since 2007. I have to say that it is the most solid, wind and weather resistant tent I have ever owned and I have owned more than a few. We purchased the 8-man version with aluminum poles (fiberglass poles are heavy and a waste of money), and floor liner. It comes with steel stakes, but we replaced them with more robust solid 12 inch solid spike stakes. It has a gear loft, cup holders, roof vents and a large vestibule. The entrance door is D shaped and it also has two large D shaped windows for ventilation. The tent uses No. 8 for the windows & No.10 ykk zippers for the door and vestibule. The tent and rain fly are supported with six very strong aluminum poles, one of which is used to support the vestibule. It has numerous guy out points all over for windy conditions and inclement weather. Pitching the tent the first couple of times is a little slow if you are unfamiliar with dome tents. Once you are used to it though, it goes up and comes down quick. The rain fly is coated with 2,000 mm rated polyurethane while the floor is coated with 3,000 mm rated polyurethane. Once it is set up, you will notice that this tent pitches extremely tight and solid. I weigh 170 lbs. and can literally lean against the side of the tent with no give whatever. Last year we set this tent up near a lake along with a tipi we own. The winds were a constant 35- 45 mph. The tipi was a beast to set up in the wind due to its height, and the fabric flapped all of the time. The Alaskan Guide 8 man set up much quicker and easier. Even in 45 mph winds it was as quiet as a church inside. The interior is large and will easily accommodate a queen size mattress and box springs if you feel inclined to bring that sort of equipment with you. The rain fly unzips over the windows so it can be rolled back and with the windows open provides very nice cross ventilation. We have used this in cold weather and never experienced condensation inside due to the windows and roof vents. The vestibule is large enough to cook in and allows enough room to store an ice chest and dirty shoes/boots. We also purchased the floor liner for it and though it is added weight it is good protection for this kind of investment. The tent with everything that comes with it weighs 31 lbs. Not light weight by any means. 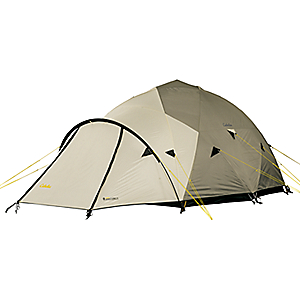 However, it is a very good strength-to-weight ratio when you consider the performance this tent delivers. It is really hard to say anything negative about this tent. We upgraded the stakes and that was all we changed. All the zippers are covered with storm flaps secured by velcro. One drawback is that when you are exiting the tent, you have to be careful to not zip the door to the vestibule in the zipper and the velcro which secures storm flap on the vestibule can catch, but this is no biggie and certainly not a deal breaker. 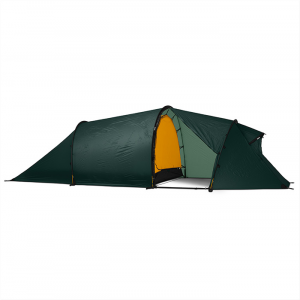 I have also used the MSR Storm King tent. Frankly, at $1000 it doesn't offer any performance or construction bonuses over the Alaskan Guide model exept that the Storm King is rated as a 5-man and is lighter by 16 lbs., more expensive by almost $400, and nowhere nearly as strong. You do pay $$$ to save weight. This is a tent I would not hesitate to use in any sort of weather or any spot on planet earth. We intend to purchase another Alaskan Guide 8 man when finances allow. If weight is not an issue, you will be hard pressed to find a stronger, more bombproof tent in this size and weight class. Incidentally, this tent, while not a backpacking tent, gets five star reviews from other backpacking sites that have reviewed it as well. Its reputation is well deserved. I purchased this four man tent for several key reasons. Primarily I wanted a strong tent that could withstand relatively high wind, rain and snow with durability to last, and be designed as a four season tent while still being easily portable. I prefer the 6 man model for the additional space, however, the four man tent is ideal for canoe camping and other such ventures. The excellent six pole design (I recommend the aluminum upgrade) makes this tent very rigid indeed, able to support 1 quart water bottles in all four holders without sagging or stressing the tent. The fully stretched and accurately sewn panels, along with the six pole design allows for relatively straight, near vertical walls which makes this tent feel very roomy even in the four man model. Ceiling height is more than adequate for a tent this size, never once did I hit my head on the LED lamp in the gear loft, being 6'6" I'm fussy about this. 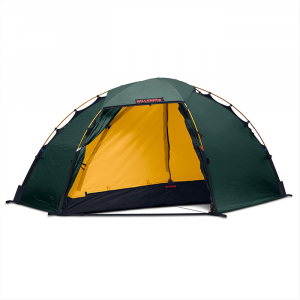 The hexagonal shape is conducive to easy setup for wilderness camping, and the three section vestibule is truly a wonderful design, too bad it isn't a bit longer and come with two adjustable poles for the awning configuration. The stake straps are highly effective, although setting this tent up is not a one man operation because you need that extra person to hold the first pole over the anchor pin and provide some support so the pole doesn't over flex and fail. After the first pole is in, one man can easily complete the setup. The tub floor is well designed and the choice of materials is first rate. The gear loft is a bit small. To give you a point of reference it's actually the same size as a bikini bottom. I'd like to be able to store more than a pack of matches up there and will probable make a larger one as my LED lamp had a habit of slipping out every once in a while. There is unfortunately a rather lengthy list of items that could stand improvement, and because this is already a good tent, with even some of these changes it would be a truly great tent. While better than most, you can give these stakes to your cousin and buy a set of 12 inch steel spikes. For this kind of all season tent you don't want your last stake bending over on you out in the boonies. Steel spikes are dominant in every type of ground, you simply can't go wrong, but they do weigh more. The guy rope metal adjusters are fussy to use and easy to bend. I'll be looking around for a better solution. Make sure you tighten all the guy rope knots as they are only loosely tied from the factory. This is area that would benefit most from a makeover. First off the fly is cut too short for a four season tent. While this definitely aids in reducing condensation and encouraging air movement during warmer weather, there is simply too much air moving beneath the fly in cooler weather. Besides, you can open both doors in warm weather and catch a breeze, and you can always open the well designed three section vestibule for additional ventilation as required. While you could pack snow around most of the base of the fly in winter weather (please keep in mind there has to be some open space around a significant area of the fly to ensure adequate ventilation) it becomes a genuine issue where you need to protect your boots and bags in the vestibule area during wet weather. The gap from ground to tent is about 8" and perhaps a bit more in the vestibule area. As a result, you'd need a fair amount of snow to reduce the drafts and you can't store anything near the inside edges of the vestibule without them getting wet in rainy conditions. Truly, with a modified vestibule section of the fly coming right to the ground you would have a very secure storage area. Although ridiculously small (on the tested four man model) and almost unusable for any day-to-day activity other than a small amount of storage, it would be wonderfully effective if it extended out another two feet or so and included the adjustable awning poles I mentioned earlier. The fly has two brass hooks on shock cording at each anchor point and these will absolutely drive you mad. My feeling is that the fly was designed and built by folks that never actually set up this tent. When you toss the fly over the tent and attempt to position it, they hook onto absolutely every pole, loop, and imaginable projection making this job a misery, forcing you to endlessly circle your tent just to get the fly in place. I admit to inadvertently amusing groups of nearby campers during every setup. Man this is just plain dumb. Thankfully, the solution is an easy one that only requires a pair of needle nose pliers and a pair of vice-grips. Opening the eyelets, I removed them from the fly and reinstalled them on the rings mounted to the heavy gauge nylon floor straps used for staking out the tent. Next time out it was a piece of cake to set up and pull the fly into place. You'll probably want to close up the velcro loops sewn on the underside of the fly (these are used to wrap around the tent poles in harsh weather) as they tend to snag as well. The net result? No more giggles from adjacent campers. The three mesh windows in the tent ceiling are rather large and let in so much cool air on my recent Rocky Mountain holiday that we were freezing in the tent even with the doors and windows zipped tight and with our jackets on. Any wind at all seems to easily make it under the fly and through these vent windows. Using a heater was an exercise in frustration as the heat was simply overwhelmed by the cold air. Excuse me, but I thought this was a four season tent.....? For hot weather you've got two doors and three zip windows to play with, but for cold weather you have absolutely no control over air flow into the tent! I didn't have much time to spend between trips and didn't want to get myself into a sewing bee. For a lead-user solution I went to my local tarp manufacturer and bought a couple of yards of cross weave 10mm white vinyl sheet and cut it into three triangular shapes a little larger than the vent windows, so the tent clips could slip through the small slits I cut and thus hold the covers in place over the windows, even while the tent is stowed. My recent overnight test saw nighttime temperatures just above freezing, and voila, no more cold drafts coming over our shoulders and down our necks. My heater was able to keep the tent nice and toasty. Meanwhile, we had enough fresh air overnight just by opening two zippered windows a small amount. Problem solved, and I can remove any of the covers with not too much effort if needed. I would like to see this as an included feature as these could easily stick on with velcro from the inside and be easy to install and independently remove as needed. I am surprised that this tent has been around for a number of years and yet has so many significant and easily remedied design flaws. While it is well sewn and nicely assembled, there are too many obvious failings which require modification and/or extra effort in order to have a truly comfortable camping experience. The fly, however, is something you'll just have to live with until a redesign is completed. In my opinion they should send one to every existing owner as a gesture of good will. I'd even be willing to pay for mine it's needed that much. I plan on keeping my Alaskan Guide 4-Man tent but would dearly appreciate a newer, redesigned fly, even for a few more dollars. Given the chance, I'd be happy to submit another review with some of these changes. I know the result would be a 5 Star rating, hands down. Tent has a lot of great features but they try to skimp on materials for the fly. If the fly were made a bit bigger, it would be a great tent all around. The ground sheet should be better quality and bigger. Somehow linked into the tent so that it wouldn't be free floating. Tent fly needs to get redesigned. Ground sheet is worthless the way it is now. Both the ground sheet and the fly were cut too short to be of much use. I bought this tent at Cabela's after reading the great reviews of this tent from others. I was looking for a 4-season tent that could take the abuse and beating in severe weather. One reviewer wrote that the fly on the tent didn't cover the tent properly allowing for the wind, rain and weather to enter making for a cold night. Another reviewer had wrote that it was the best thing since sliced bread. I was planning on a 4-day long weekend of camping so I purchased the tent to try it out. I assumed the first reviewer possibly hadn't set the tent up properly. The tent itself was nicely designed and laid out for space. The fly for the tent was cut way too short, it was short by about 8 inches all the way around. This surely wasn't a 4-season tent as they had described. Our weekend was dry and warm but I could still envision how the rain and wind would blow into the tent making for a miserable day or night. I purchased the ground sheet for it as well but that was another mistake, it was nothing more than an over-sized "Glad bag" so thin and easy to tear. Again it was cut too short (undersized) to be of use for the tent. The ground sheet was just one loose item, no way to lock/secure to the tent. It just free floating. I have another 2 man tent from REI, the ground sheet lugs into the tent poles to secure it. When the weekend was over, back it went to the store. Worst buy I ever made. I went out and bought a 3-person North Face VE-25 tent, best tent on the market in my opinion. For the past 8 years I have gone to the National Parks for a two-week camping trip (late August-Sept). This tent has been TERRIFIC! The 1st night out we couldn't use all the stakes because of the rocky terrain. The tent withstood the high winds and we got a good night's sleep (despite the wind). I've had no problems with rain (seams are couple inches off the floor and the rain fly covers the entire tent). Assembly is fairly easy--does take two people. I would definitely purchase another ALASKAN Guide tent!!!!!! Ease of Setup: The tent is not diffucult but it does require two people and a little bit of practice. We have set it up in the dark twice now. Purchased the 6-man Alaskan Guide tent from Cabela's in June 2004. Have used it on three seperate trips. As the other reviews have pointed out it can be a challenge setting up if you have not read the directions and practiced in the backyard prior to the first trip. Once you have a routine established it can easily be set up by two people in less than 20 minutes. It would be very difficult for one person to set the tent up. On the most recent trip we encountered two days of almost constant rain. At no time did any of the rain make inside with us. The front zipper does on occasion get stuck in the overlapping material. However, because of the oversized zipper it is no problem getting it immediately working again. The features are terrific. The cup holders have come in very handy and the top ventilation openings really help keep the tent cooler in the summertime. They can be closed for cooler weather. The built-in pockets are great for storing keys, insect repellant, glasses, flashlights and so on. The only possible design flaw, and that is too strong a term, is that when it rains a lot and all the tie downs are not utilized then rain will collect in the very top of the fly between where the main poles cross. At no time did the water seep through and we just would push it out from the inside. The tent is sold to sleep six people. However, if you have any gear, use air mattresses and want any room to move around three would be the maximum. We planning on purchasing the large vestibule in the near future. Overall we are very pleased with the tent and plan to use it for many many years. This is an extra heavy duty tent. Makes a good base tent or truck/car family camping tent. It's very strong at the expense of weight. They claim testing in up to 100mph winds with no problems due to its shape and strong construction. I've used this tent in heavy rain downpours and strong winds and had no problem. get the vest. it's worth it. This tent should last for years. comes in 2, 4, 6 and 8 person sizes. Six poles over the tent and one over the door overhang means it will hold hundred of pounds of snow without budging. Call for Cabela's free Master Catalog: 1.800.237.4444. This tent is made exclusively for Cabela's and sold nowhere else. They won't say who the manufacture is. The tent is the strongest I've seen and I've had some name brand tents in the past. Feel free to e-mail me if you want to exchange notes on this tent. One time setup in my yard. On my four-day trip I ended up staying in motels because I couldn't use this tent due to windy and cold conditions. Welcome to Trailspace, Christian. Can you tell us about your trip and the conditions where you couldn't use this tent and what went wrong? Thanks! I have both the 8-man tent and the 6-man tent with the added floor protector for both, plus they made a corridor to connect two tents. We use the 8-man tent to sleep in and the 6-man to keep all of our gear. These tent are extremely strong and by far the most well made tents I have had. The tent is made of good material for the seasons. Source: Got it new at a garage sale. The tent is made of good material for the seasons. Would be a nice all-season tent. I bought this tent for camping with my family in Alaska. 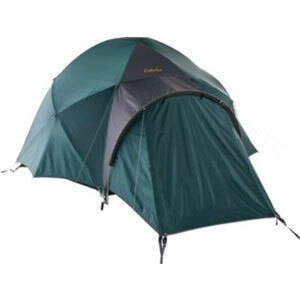 I used it three seasons and it is one of the best tents I have owned. It even went through winds approximately 30 mph and gusting higher. It even was warm in April hunting waterfowl and we ended up with 4" of snow. We have had this tent since at least 1985. We camp all over and the world. It turns water, holds up in the wind, and you can stand up in it. I have had some problems with the fiberglass poles, but 35 years will do that. The tent is easily put up by either 1 or 2 persons. I can do either. I think we gave $300 for this tent when we first purchased it. After 30 years the poles are a little decrepit and the zippers are giving us a little trouble. We have had it out weeks at a time. Next trip Europe for two months very shortly. I am 74 and it is going to outlive me. I would buy again!! Oh, Cabela's is a little chintzy on their lifetime warranties!!! In reference to who makes the Alaskan Quide tents for Cabela's; I also contacted Cabela's to ask who made their tents, they would not tell me either. I e-mailed Kelty and asked if they made any camoflauged tents, and they "strongly hinted" me to Cabelas.